The Knitter’s Pride Marblz Interchangeable Circular Needle Set is back in stock. Marblz are lightweight and smooth yet exceptionally strong and durable. Acrylic is skillfully hand-mixed to produce unique colors and patterns making each needle tip in this set a work of art. The needles boast pointy tips, smooth joins, and a comfortable surface that provides just the right amount of ‘grab’ to allow for easy handling of slippery yarns. Presented in a special black & white box which shows off the beauty of these needles, the set includes 9 pairs of Marblz interchangeable needles in US sizes 4, 5, 6, 7, 8, 9, 10, 10.5 & 11, (3.5 mm through 8.0 mm) four cables in lengths of 24”, (2) – 32” & 40”, a needle gauge, and a set of cord connectors. An original idea guaranteed to make blocking your knitted projects easier! 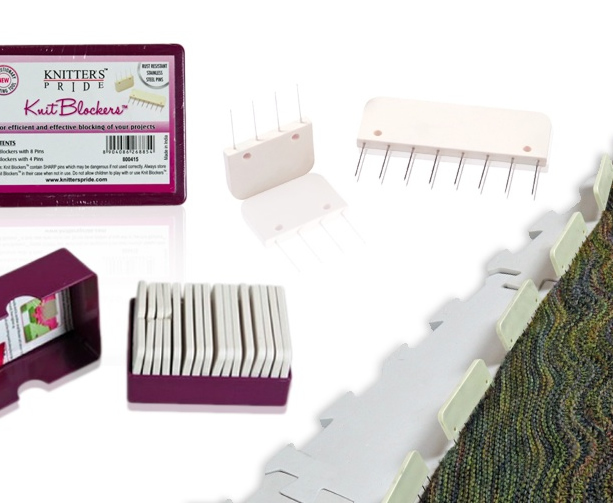 Knitter’s Pride Knit Blockers significantly speed up the blocking process and help maintain even tension across a wider area than individual pins. Ideal for blocking on straight edges like sweaters, shawls and scarves. Made using tough plastic with sturdy, rust resistant stainless steel pins embedded along one side. Designed by knitters for knitters!